Engineering experiments and design projects could include medium scale photovoltaic panels, water heaters or solar ovens. This project is particularly well suited for introducing or reinforcing a variety of fundamental physics concepts including forces and motion, projectile motion, levers and mechanical advantage and velocity and acceleration. This project is used as the basis for GEARS-IDS lessons that focus on force and friction. Engineering and technology students can use this test stand to measure and calculate the torque, current draw and rpm of the gear head motors included in the GEARS-IDS Kit. This information can be used to determine the forces generated by drivetrains and mechanisms that you and your students design. Engineering and technology students can use this mobile chassis as a platform for radio controlled or fully autonomous robots. This platform can be integrated with the pneumatics, servos and mechanical components contained in the GEARS-IDS Kit to easily create sophisticated game playing robots. This project can be used to introduce or reinforce concepts and skills related to; fluid power, mechanical linkages, volume, area, force and pressure, Boyle's Law, Charles' Law, The Ideal Gas Law and basic algebraic manipulations. This project can be used to to design and build competitive robot athletes, in the comfort and convenience of your own classroom. The GEARS-IDS Kit makes it possible for you to design and build competitive robot athletes, using industrial engineering components, in the comfort and convenience of your own classroom. Easy to build Construction Instructions for the Verminator Robot Chassis using the GEARS-IDS Kit. 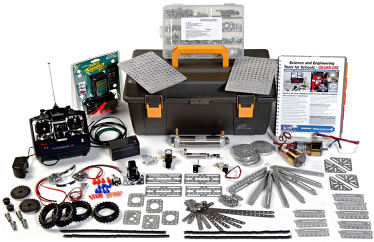 The GEARS-IDS Kit makes it possible for you to design and build a variety of engineering projects using industrial engineering components, in the comfort and convenience of your own classroom.